100 no pressure projects | Sew Lindsay, Sew! It feels like just yesterday I was writing the blog post titled “Welcome, Baby Finn!” And now I’m writing part two – Welcome, Baby Nora! Baby Finn is not such a baby anymore, and now he’s a big brother to sweet Nora Elizabeth – my beautiful niece, who is just six weeks old. I had the honor of meeting Nora and spending lots of snuggle time with her last week. A few years ago, I didn’t have any nieces or nephews – and now I have two! I feel so lucky to be an Auntie times two. I had a tough time deciding what kind of quilt to make for Nora. I really liked the airplane quilt I made for Finn, and initially felt like I should make a similar one for Nora – just swapping out the color scheme and the airplane shape for something new. But I eventually decided to do something completely different and one-of-a-kind, made just with Nora in mind. I was sorting through the patterns I’ve had in my collection for a few years, and I found Simplicity 2935 – a butterfly rag quilt. I did some Googling to see what other people’s finished quilts looked like, and I was completely sold after seeing a photo of a baby laying on a finished quilt. It looked like the baby had butterfly wings! Here’s a photo of Nora with her finished quilt. I love, love, love how it turned out. Look at this sweet baby butterfly! I spent a lot of time shopping around online for fabric. The reason I started online versus in the store is because I wanted to find a collection that was designed to go together. When I saw this fabric from Riley Blake, I knew I had to have it! The floral and pink fabrics are from a collection called Just Sayin’ by My Mind’s Eye (White Floral and Pink Dot) and the mint fabric is the Confetti Cottons Songbird Solid, also from Riley Blake. This was the first time I’ve worked with a designer fabric like Riley Blake, and – wow! I could really feel the difference in quality from the type of fabric I’d typically get from a big box store. Because I’m a perfectionist when it comes to my projects, especially a project as important as a quilt for my very first niece, I first used Photoshop to mock up what the butterfly pattern would look like with the fabrics I wanted to use. I had to decide which fabric I’d use for each section so I could figure out how much of each fabric to order. Side note… I eventually decided to leave the eyes off completely. They’re kind of creepy. There were an overwhelming number of fabric combinations and possibilities, especially since I first toyed with the idea of using a lot more fabrics – the pattern called for NINE different fabrics. Yikes! I tried some mock-ups with nine fabrics, but I didn’t like any of them, so I eventually narrowed it down to just three. The fabric math was a little complex since I switched up the fabric numbers from what the pattern called for, and I’ll admit it stressed me out a bit as I tried to figure it out. Luckily, it all worked out and I didn’t have to order any extra once I got started. If you’d like to replicate the butterfly layout above, I got 5 yards of the white floral, and 2 yards each of the pink dot and mint. I JUST made it with the white floral – I had a bit leftover of the other two. And of course, I had a helper in the sewing room – Winnie! Whenever I lay fabric pieces on the floor, she just can’t help but immediately lay down right in the middle of my workspace. I admittedly spend a lot of time pushing her out of the way (with love, of course), but it’s nice to have company all the same… especially during those late-night sewing sessions. Here are a few progress pics with my little helper! Overall, I definitely recommend this quilt pattern. Joining the curved pieces can get little tricky, but the pieces did fit together perfectly like a puzzle and I adore the finished product. The butterfly quilt not only made for a picture-perfect backdrop for Nora, but also lent to some sweet moments between Nora and Finn as we spent some time outside together last week! 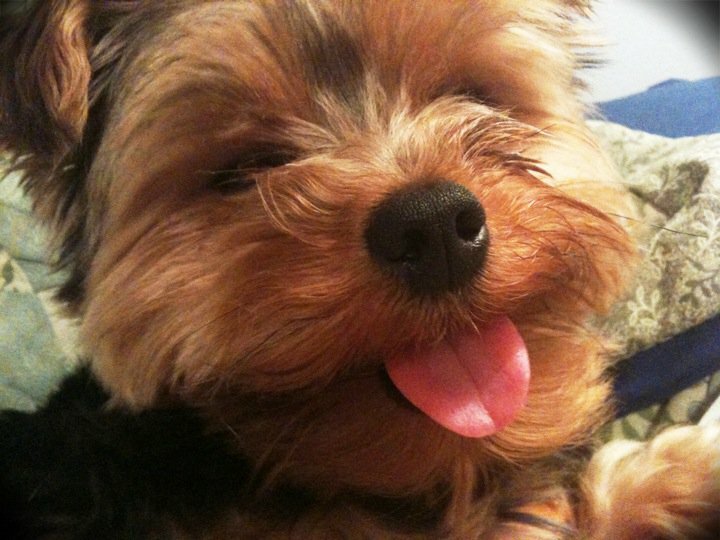 Look at this cuteness. I can’t wait to see Nora grow with her special quilt! I know the title of this blog post gives away the grand reveal, but… hey guys. I made a hat. A hunting cap, to be more specific. Why? Just because. I had a pattern and wanted to try it. Also, making a hat or some sort of headwear was a bucket list item on my list of 100 No Pressure Projects. Sisters. I’ve never had any. Until this past summer, when my brother got married and I gained an awesome sister-in-law, Sarah. Let me tell you about Sarah. She is the best. As a baby of the eighties, my most defining childhood moments took place in the 1990’s – so just add me to the long list of millennials who get a misty, nostalgic look when reminiscing about American Girl dolls. Yes, American Girl dolls are still around and have continued to exponentially grow in popularity… but there’s something special about those early years when there were only three historical dolls and purchases only followed hours and hours of pouring over the snail mail catalog. For anyone who has ever had an American Girl doll, there’s something sort of defining about declaring who “your” doll was – your first doll, or your doll of choice, that is. For me, that was Molly, the character representing the World War II era. I received the book Meet Molly as a gift in 1990, and the rest is history. I quickly plowed through all the books in the series and the Molly doll was at the top of my Christmas list for Santa that year. Over the years, I received a few additional outfits and accessories for Molly from the beloved, dog-eared American Girl catalog that arrived in the mail every few months. Then I received a gift for my First Holy Communion from a family friend — a First Communion dress for Molly that even included a clip-on veil. Whaaaaaaat??? My eight-year-old mind was blown. There were doll clothes out there that weren’t in the catalog. There were people out there who could make anything I wanted for Molly. This was all news to me. I LOVE Valentine’s Day. I know I’m in the minority, but I just do. I really don’t think you need to have a significant other in your life to enjoy candy heart bliss and bountiful boxes of $1.99 Valentines! Sometimes I get a little defensive about it — loving a holiday that so many others despise can be a little exasperating. I always make an effort to give Valentine’s Day the attention it deserves! I recently completed the LOVE paper piecing pattern by Diane at From Blank Pages, available here on Craftsy. Diane, along with Sandi at Crafty Planner, was offering the letters L-O-V-E for free so I could try out the pattern before committing to the entire alphabet. I created this little quilted swatch using scraps, but haven’t yet decided what to do with it. I think it may become a zipper pouch or just a little Valentine’s Day wall hanging. Ideas and suggestions are welcome! By completing the pattern and linking it to the designated hashtag on Instagram, I was entering for a chance win the entire alphabet pattern (including numbers and punctuation) and I WON! Waking up to the message that I had won this morning was so magical. I am really, really, really excited to put the alphabet pattern to good use in the future and make lots of personalized, paper-pieced goodness! Meet my friend Laura — we have known each other since we were in kindergarten and she is still one of my dearest friends. Eighth grade volleyball, dorky haircuts… and proof that we turned out alright in adulthood despite the dweeby photos. This fall/winter, I haven’t been that great about updating the blog – yikes. But just because my blog has been stagnant doesn’t mean my crafting has. I’ve been doing lots of things behind the scenes, just haven’t taken the time to write about them. Or I can’t, because I’m in Christmas elf mode and everything is a secret! Even though Halloween is over, I want to rewind a little bit and highlight this little experimental project I tackled earlier in the fall. I took my first shot at foundation paper piecing a quilt block! In my quest to follow crafty social media accounts, I’ve found a lot of quilt-y friends who frequently post about paper piecing. Needless to say, their constant paper piecing posts (can you say “paper piecing posts” ten times fast?) piqued my curiosity and I decided to give it a try around Halloween with this pumpkin paper piecing (free PDF pattern available here). I initially thought this would be a really basic story: “Look at the cute gift I made for my friend Melanie’s birthday! The end.” But this story ended up having a cool, coincidental twist! Read on. My lovely friend Melanie (who, by the way, was the ringleader for our 2014 Disney Princess Half Marathon running group) lived in Tokyo for a few years and once told me she really loves cherry blossoms because they remind her of her time spent in Japan. I have always remembered this fact because I, too, love cherry blossoms — but I really have no reason for loving them, other than I like the way they look (sadly, I have not visited Japan) (yet) (hint hint, Tokyo Disneyland anybody?). I had a bit of cherry blossom fabric leftover from some other projects, so I put it to the side for Melanie and revisited it while working on her birthday project. And the zipper, which matched perfectly, came from my crazy bulk zipper stash – I’m slowly working through those and finally starting to make a dent! In the spirit of trying new things, and also tackling my 100 No Pressure Projects List, I decided to make a bow pouch that I had seen on Pinterest some months ago. As I tend to do with all zipper pouch projects, I used a mashup of tutorials — the Little Bow Clutch Tutorial on This Big Oak Tree and my favorite zipper pouch tutorial on Make It Perfect. And I love the way it turned out. Love, love, love. I lined the inside with a charcoal/black calico print I already had on hand because it seemed to flow with the floral theme. 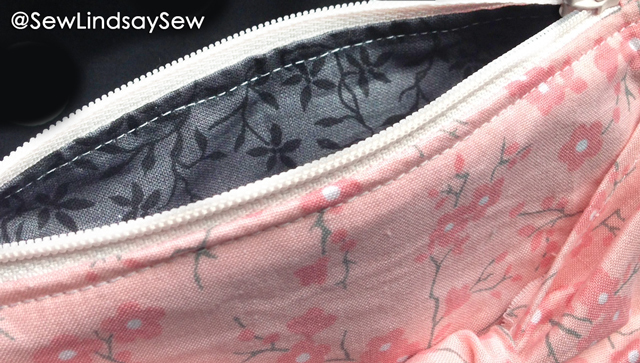 I never, ever line zipper pouches with the exact same fabric I’ve used on the outside. Because that would be boring! But here’s the fun (and educational) coincidence. Do you know what furoshiki is? Yeah, neither did I… according to the trusty (ha) Wikipedia, “furoshiki is a type of traditional Japanese wrapping cloth traditionally used to transport clothes, gifts, or other goods.” Apparently when Melanie was living in Japan, she received a baby gift that was wrapped in furoshiki and looked just like this bow pouch – so not only the cherry blossoms, but even the design, is sentimental for Melanie. An example of furoshiki from the Wikipedia. So how coincidental is that? I had no clue. I just picked the bow design because I wanted to try something new and I thought it looked cute – but Melanie was destined to receive this design. It was obviously fate! 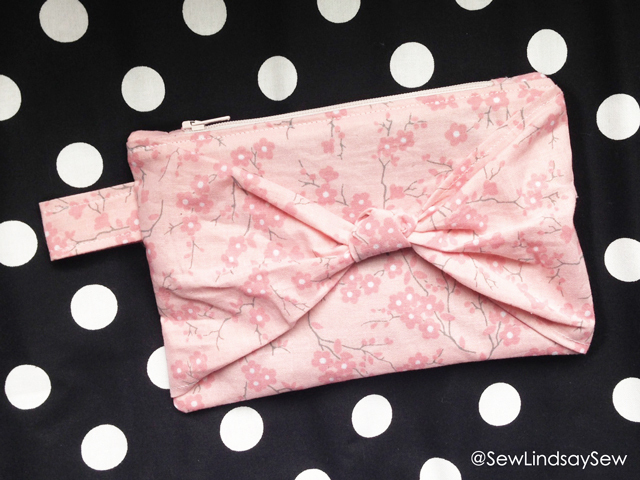 But whether it’s a bow clutch or furoshiki – there will definitely be a lot more of these bow clutches in my future. 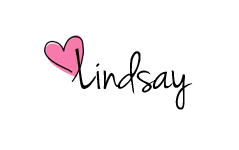 PS – After I wrote this post, it sat in my blog queue for awhile because I wanted to make sure Melanie approved before I posted. Between the time I wrote this and the time I posted it, Melanie brought me the most wonderful book — Furoshiki Fabric Wraps by Pixeladies. 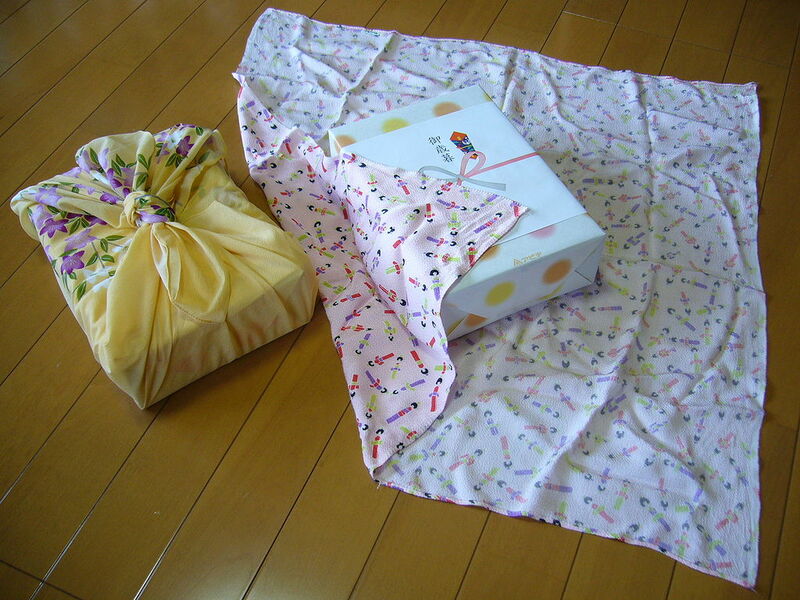 The book has beautiful photos and detailed instructions for wrapping all sorts of gifts in fabric! I AM IN LOVE WITH THIS BOOK. You can bet I will be writing about some of these wraps when I try them out. And now I’m convinced I need to buy a serger so I can serge all of my fabric and use it for furoshiki! Project diversity: Some things on the list are specific projects I’ve always wanted to complete. Others are more open-ended and scavenger-hunt-esque (e.g., something inspired by my hometown). I’m a weirdo: Some things on the list may seem kind of strange without explanation — but I promise to explain the background in full detail when each project is completed and I get the chance to write about it. I’m repeating some previous goals: There are some things on this list I’ve already done. Like gifts for certain family members. Or projects inspired by Disney characters. But I’ve left these on the list because I have more ideas and I intend on tackling these goals once again! No pressure: There’s no timeline for this list. I may get through one project next weekend — and another project a year from now. 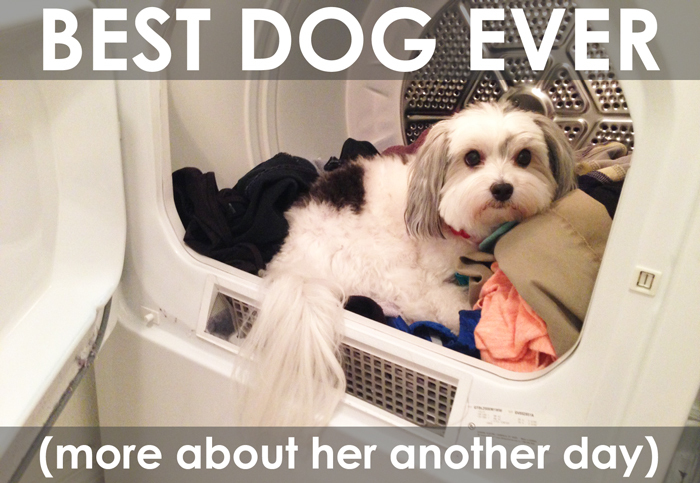 This list is just for fun — not to fulfill some crazy “project a day” challenge or something. I work full time and have a life unrelated to sewing and blogging, y’all (shocking, I know) — so this shouldn’t be something that keeps me awake at night. There will still be side projects – lots of side projects! My future sewing projects won’t be limited to this list. If something else pops up, I’ll still sew it and blog about it and all that. But it just won’t be a part of THIS challenge! I have a feeling tackling this list will really slow down as my gift-giving ramps up around Christmas time. This list won’t change, but my priorities might! Shout it out: If there’s something on this list you really want to see me tackle, let me know — maybe I’ll make it next. Similarly, if there’s something on this list you’ve already made and you have helpful tips or tricks — please share! 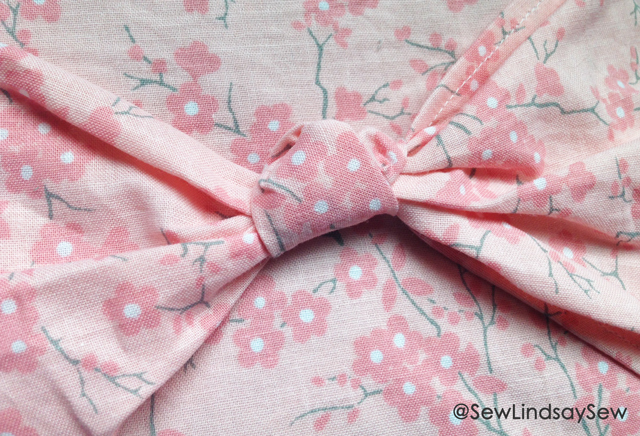 Selfish Sewing – aka, stuff for me! 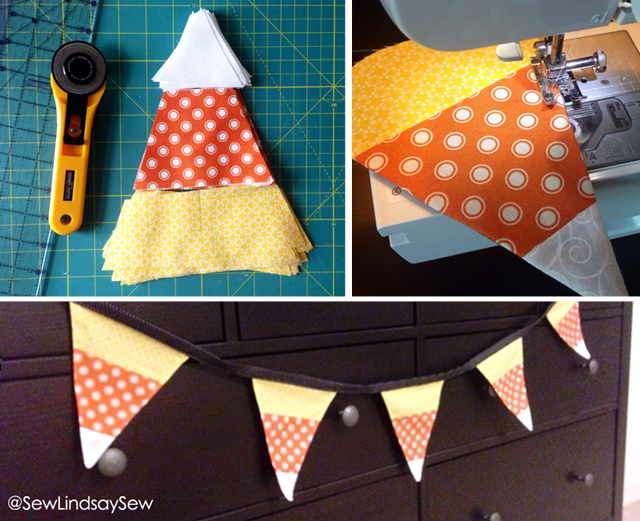 Bunting — for every month of the year! Something inspired by my favorite animals – sheep! So there you go! I had a hard time splitting the list into categories and having the numbered bullets actually list the numbers 1 through 100, but I promise there are 100 projects listed there. One Hundred Projects on the horizon, guys! Plus a whole bunch of miscellaneous projects that are sure to pop up throughout the journey. Like I said before, these aren’t the ONLY projects I’ll be working on — after all, this doesn’t include any of the top secret stuff. 😉 Thanks for following along and supporting me through the first 100 blog posts!